A little goes a long way with MoHop’s Susanna low heels. 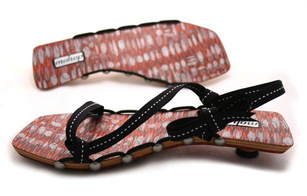 The patent-pending strapping system allows buyers to customize this low profile, eco-friendly shoe. The ribbons that tie these shoes on come in various lengths and styles so that you can achieve multiple looks with one sole. Create a new look each time! The modified kitten heel and square toe make this slip-on an interesting, dressed up alternative to flip-flops. The rubber soles are made from recycled tires, the wooden bases are Finnish birch plywood, and the foot beds are screen-printed by hand thanks to Chicago’s legendary Screwball Press. Dare to be different. Try Mo’Styles with MoHop. Now $155 on Greenloop.